Those that process each input file to produce exactly one output file, which is a modified version of the input file: Filtering, Pattern filtering, Base presence filtering, Remove redundant sequences, Sort, Reallocate reference sequences, Rename header, Reformat file, Grow sequences, NCBI rename, Undo alignment, Disambiguate sequence names, and Clustal Omega Alignment. Those that produce a different number of output files: Split, Merge, Consensus sequence, Concatenate sequences, Compare, and Blast. This operation allows filtering sequences based on different criteria (e.g. sequence length, non-multiple of three, or in-frame stop codons presence, among others). Valid starting codons: filters sequences so that only those starting with the selected codons are kept. Remove stop codons: removes stop codons from the end of the sequences. Remove sequences with a non-multiple of three size: filters sequences so that only those having a length that is multiple of 3 are kept. Remove sequences with in-frame stop codons: filters sequences so that only those without in-frame stop codons are kept. Minimum sequence length: filters sequences so that only those with the specified minimum sequence length are kept. A value of 0 indicates that no minimum sequence length is required. Maximum sequence length: filters sequences so that only those with the specified maximum sequence length are kept. A value of 0 indicates that no minimum sequence length is required. If the header count filtering option is selected at the sequences level, then it filters sequences so that only those meeting the specified criteria regarding header counts are kept. See the examples to learn how to use this filter. Minimum number of sequences: filters files so that only those with the specified minimum number of sequences are kept. Maximum number of sequences: filters files so that only those with the specified maximum number of sequences are kept. If the header count filtering option is selected at the files level, then it filters files so that only those where all sequences meet the specified criteria regarding header counts are kept. See the examples to learn how to use this filter. Remove by size difference: filters sequences so that only those with the specified difference when compared to the reference sequence are kept. Maximum size difference (%): the maximum sequence length difference allowed expressed as a percentage. Reference sequence index: the index of the sequence to use as reference to compare to others. The first sequence corresponds to index 1. 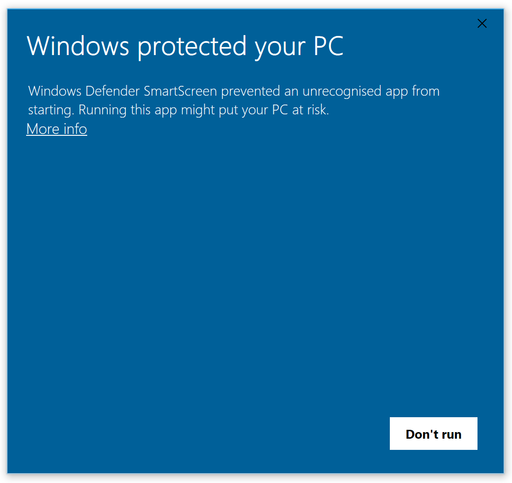 This option is ignored if a reference sequence file (next option) is selected. Reference sequence file: the file containing the sequence to use as reference to compare to others. If a file is selected, then the reference sequence index is ignored. 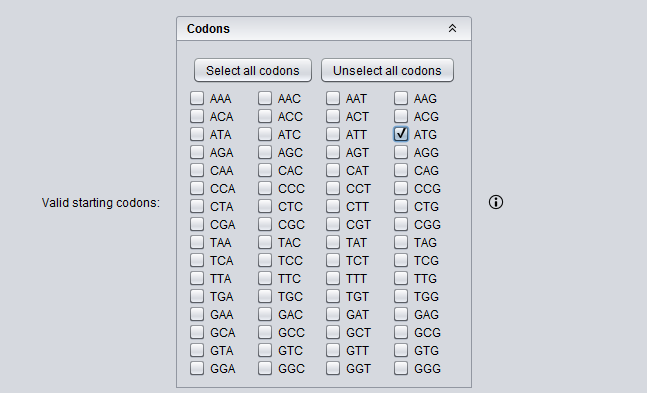 By clicking on the ‘Codons‘ label, a list with the possible starting codons is shown, allowing to select one or more starting codons. The following example shows how the input FASTA is filtered to keep only those starting with ATG. The following example shows how sequences in the input FASTA are modified to remove stop codons from the end of the sequence. Note that this option actually modifies the input sequences. This example shows how sequences with a non-multiple of three size are removed from the input FASTA. Only Sequence1 and Sequence2, with 15 bases, appears in the output FASTA. Sequence3 is removed since it has 17 bases. This example shows how sequences containing in-frame stop codons are removed from the input FASTA. Only Sequence2 does not contain in-frame stop codons, so that it is the only one in the output FASTA. This example shows how sequences with a length below 7 are removed from the input FASTA. Thus, only “Sequence3”, with 15 bases, appears in the output FASTA. “Sequence1” and “Sequence2” are removed since they have 4 and 6 bases respectively. This example shows how sequences with a length above 5 are removed from the input FASTA. Thus, only Sequence1, with 4 bases, appears in the output FASTA. Sequence2 and Sequence3 are removed since they have 6 and 15 bases respectively. Sequence2: 24 bases. Difference: 1 → 1/25: 4%. Sequence3: 23 bases. Difference: 2 → 2/25: 8%. Sequence4: 22 bases. Difference: 3 → 3/25: 12%. Sequence5: 21 bases. Difference: 4 → 4/25: 16%. Thus, only Sequence1, Sequence2 and Sequence3 are kept in the output FASTA. This example shows how to use this filter in order to remove all sequences in the input FASTA whose sequence identifier appears exactly two times among all sequences. By using the configuration above, only Sequence1 and Sequence3 are kept in the output FASTA. If the same is applied at the files level, then the input FASTA would not appear in the output directory. This example shows how to use this filter in order to remove all sequences in the input FASTA for which a word defined by a regular expression does not appear one or two times. Those containing Homo_sapiens: Homo_sapiens_1, Homo_sapiens_2, and Homo_sapiens_3. Those containing Gallus_gallus: Gallus_gallus_1 and Gallus_gallus_2. The operation filters the sequences so that only those for which their corresponding groups have a size between 1 and 2 are present in the output FASTA. This operation allows to filter sequences based on a text pattern (note that this pattern can be also a regular expression, see section Pattern configuration for further details). Filtering can be applied to either sequence headers or the sequence content. Header or Sequence: check Sequence to look for the pattern on the sequence content or Header to look for the pattern on the sequence header. Convert to amino acid sequence before pattern matching: when filtering sequences based on the sequence content, it is also possible to indicate that the sequences must be converted to amino acid sequences before applying the pattern. See below for further information on this configuration. Please note that nucleotide sequences containing ambiguity codes will not be translated generating an error. 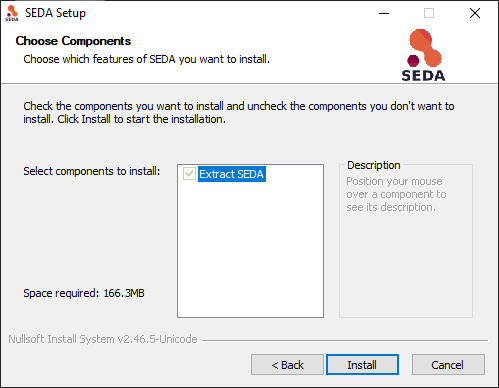 Pattern: SEDA allows to define patterns in different ways. Refer to section Pattern configuration to learn how to create patterns. When filtering nucleotide sequences based on amino acid patterns, the ‘Convert to amino acid sequence before pattern matching option should be enabled. This option allows to configure the translation mode using the panel below. Starting at fixed frame: by selecting this option, sequences are translated starting at the specified frame. Considering frames 1, 2 and 3: by selecting this option, three translations starting at frames 1, 2 and 3 are created. This way, the pattern is applied to each translation separately and it is considered present if it is present in any of the translations. If the ‘Join frames’ option is used, then the three translations are concatenated before testing the pattern. This is useful if a set of sequences is being processed and the composed pattern should be found in any of the frames, one part of the pattern being present in one frame and another part in a different frame, as in the case of intron containing gene sequences. Use reverse complement sequences: whether reverse complement of sequences is used before translation or not. If not selected, sequences are used as they are introduced. The following example shows how an input FASTA is filtered to obtain only those sequences containing at least one ACTG. In the following example, sequences are filtered based on their headers. By using the pattern Homo_sapiens, only two sequences are kept in the output FASTA. This operation allows filtering sequences based on the percentages of their bases (nucleotides or amino acids). By using the configuration panel shown below, you can add one or more bases and specify their minimum and maximum percentages. Sequences with bases whose percentage of presence is outside the specified thresholds are removed. Moreover, if you specify several bases in a single row then the sum of each percentage is used for checking the thresholds. For instance, to filter the input FASTA in order to obtain only those sequences with a percentage of A’s between 0.35 and 0.40, the following configuration should be used. In this case, only the first sequence will be in the output file. For instance, to filter the input FASTA in order to obtain only those sequences with a percentage of T’s or G’s between 0.10 and 0.20, the following configuration should be used. In this case, only the second sequence will be in the output file since the sum of T’s and G’s is 0.16 while in the first sequence is 0.32. This operation allows removing redundant sequences. Redundant sequences are sequences with exactly the same sequence bases. If the ‘Remove also subsequences’ option is selected, then sequences contained within larger sequences are also removed. Option ‘Merge headers’ allows controlling how new sequences are created. If this option is not selected, then the header of the new sequence is the header of one of the two being merged. On the contrary, if this option is selected, the header of the new sequence is created by concatenating the headers of the two sequences being merged. 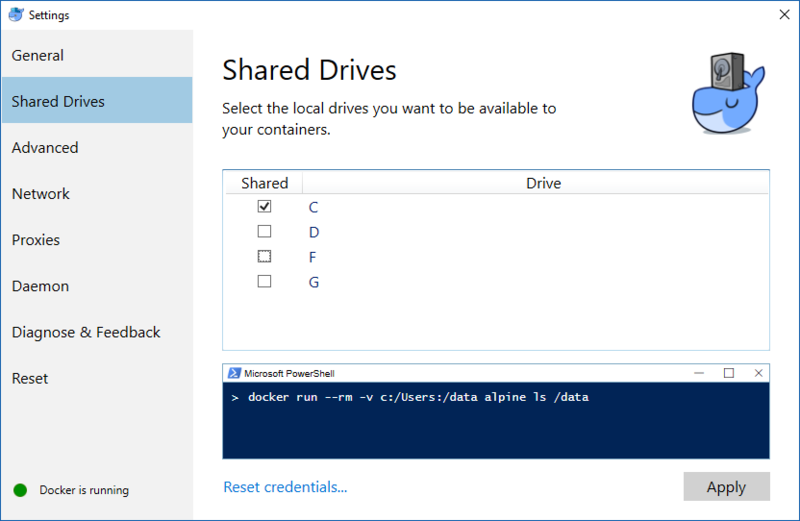 You can also save a report of the merged headers into a file by selecting the ‘Save merged headers into a file’. When removing redundant sequences, it is also possible to indicate that the sequences must be converted to amino acid sequences before checking if they are redundant. This way, it is possible to filter nucleic acid sequences based on amino acid patterns. To do so, the ‘Convert to amino acid sequence before sequence comparison’ option should be enabled. Please note that nucleotide sequences containing ambiguity codes will not be translated generating an error. This option allows to configure the translation mode using the panel below. Considering frames 1, 2 and 3: by selecting this option, three translations starting at frames 1, 2 and 3 are created. This way, each translation is tested separately and the sequence is considered redundant if any of the three frames is redundant. The following example shows how only exact sequences are removed. Since Sequence1 and Sequence2 have the same nucleotide sequence, they are combined in the output FASTA. The ‘Merge headers’ is selected to illustrate how sequence headers are combined. The following example shows how both exact sequences and subsequences are removed. Since Sequence1 and Sequence2 have the same nucleotide sequence, they are combined in the output FASTA. Sequence3 is also combined with the previous combination because CCATGGGTACA is contained in it. This operation allows to sort sequences. Sort can be made based on sequence headers or on the content of the sequences. You can choose between two criteria to sort them: length or alphabetical. By default, sequences are sorted in ascending order (e.g. the shortest sequence in the first place). The ‘Descending’ option allows to sort sequences in descending order (e.g. the longest sequence in the first place). The following example shows an input FASTA file sorted by sequence length (i.e. number of bases) in descending order. Fixed number of sequences per file: it divides each input FASTA into several files containing the defined ‘Number of sequences’ in each one. Fixed number of files: it divides each input FASTA into the defined ‘Number of files’ with the same number of sequences in each one. Fixed number of sequences per defined number of files: it divides each input FASTA into the defined ‘Number of files’ containing the defined ‘Number of sequences’ in each one. In this mode, the result of multiplying ‘Number of files’ by ‘Number of sequences’ should be less or equal to the number of sequences contained in the input FASTA file being processed. Nevertheless, in some occasions it may be necessary to do that. The option ‘Independent extractions’ allows doing this. See the examples section on how this option works. In addition, if the ‘Randomize’ option is selected, sequences in the input FASTA are sorted in a random order before producing the output FASTA files. The following example shows how to split an input FASTA file containing 5 sequences into files containing 2 sequences. Three output FASTA are created: two containing the specified number of sequences (2 sequences) and one containing the remaining (1 sequence). The following example shows how to split an input FASTA file containing 5 sequences into three files. Three output FASTA are created: two containing 2 sequences and one containing 1 sequence. The following example shows how to split an input FASTA file with five sequences into three files containing one sequence. Note how input order is kept in the three output FASTA files that are created. If the ‘Randomize’ option is used, the following output with sequences in a random order can be obtained. Finally, if you want to obtain three FASTA files with three sequences each you need to use the ‘Independent extractions’ option. This option is usually combined with the ‘Randomize’ option. By doing this, the following output could be obtained. This operation allows to split each input FASTA file based on regular expression patterns. This operation matches the defined regular expression pattern against the sequence headers to make groups using the matching parts. Group names files directory: whether the groups created for each file should be saved into a TXT file or not. This allows an easy identification of the sequence groups that have been created. If you do not want to save them, leave this file empty. 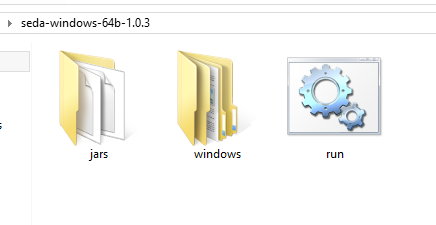 Otherwise choose the directory where such files should be created. Header matcher configuration: this option allows to specify how sequences must be grouped to form the new files. 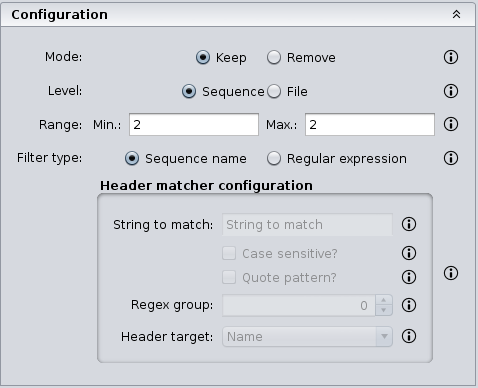 String to match: the regular expression that must be matched in the sequence header. Case sensitive? : whether the string must be matched as case sensitive or not. Quote pattern? : whether the regular expression pattern must be quoted or not. When the regular expression is quoted, metacharacters or escape sequences in it will be given no special meaning. Regex group? : the regular expression group that must be extracted. Default value is 0, meaning that the entire result must be considered. Use values higher than 0 when there are brackets in the regular expression in order to select the desired group. Header target? : the part of the sequence header where the string must be found. This is a powerful option that allow complex splits. For instance, it can be used in those scenarios where sequences from two or more species are mixed in the same FASTA file and one FASTA file per species is wanted. Consider the input FASTA below that contains sequences from three species: Homo sapiens, Gallus gallus, and Mus musculus. When it is processed using the configuration below, three output FASTA files are obtained. Basically, the regular expression ^[^_]*_[^_]* is able to extract the common species names from the headers so that sequences are grouped based in them. This operation allows to find one or more sequences (i.e. your reference sequences) using a pattern filtering option and reallocate them at the beginning of the file. 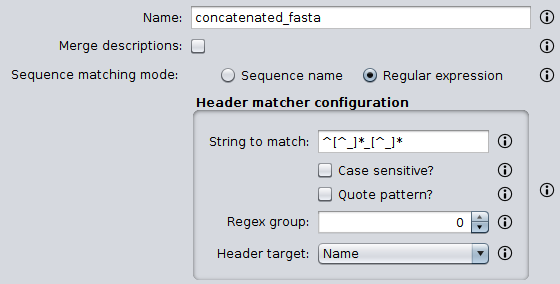 For instance, this operation is useful to place at the beginning of your FASTA files the reference sequence or sequences and specify them in the ‘Remove by size difference’ filtering operation. The configuration of this operation is the same as the Pattern filtering configuration. Thus, you may refer to Pattern filtering section to learn how to use it. The following example shows how an input FASTA file is processed to reallocate those sequences containing ACTG at the beginning of the file. The following example shows how an input FASTA is processed to reallocate those sequences containing Homo_Sapiens in their headers at the beginning of the file. This operation allows to modify the sequence headers in different ways. These ways are specified in the ‘Rename type’ parameter, which allows choosing between: Multipart header, Replace word, Replace interval and Add prefix/suffix. Each of these methods is explained below. Common to all these methods is the ‘Target’ parameter, which allows to specify which part of the sequence headers must be processed: Name, to process only the sequence identifier; Description, to process only the description part of the header; or All, to process both name and description together. 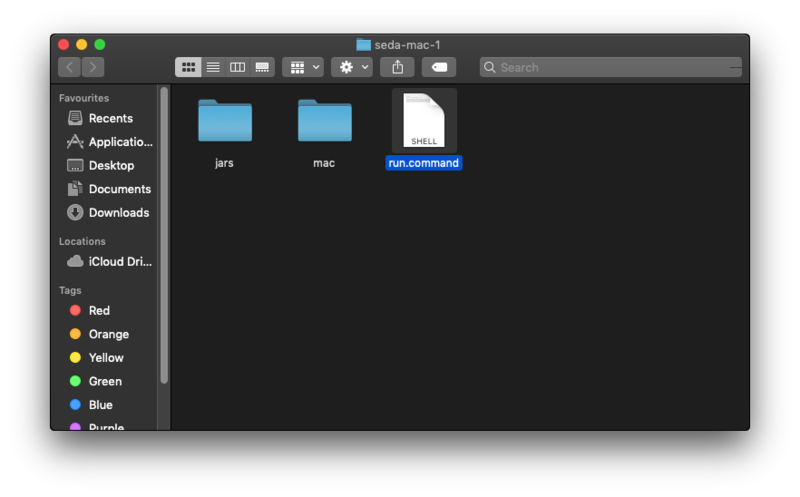 If a file selection has been done, the ‘Rename preview’ area shows you a preview of the current configuration applied to the first sequence of the first selected file. The ‘Multipart header’ rename allows to split the sequence header into fields delimited by the characters specified in the ‘Field delimiter’ parameter. Then, you can select which fields you want to keep or remove and which delimiter (‘Join delimiter’ parameter) should be used to create the new sequence header. As you can see, fields are separated by a blank space. 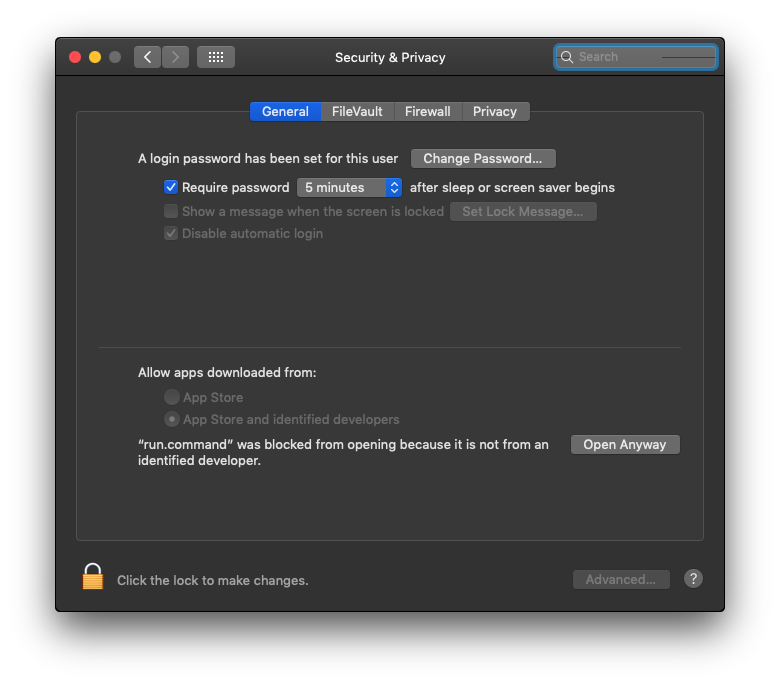 Thus, this rename mode is useful to remove those fields you are not interested in. The following example shows how only field4 is kept in the output fasta. The configuration applied to do this should be: ‘Target’ = ‘Description’, ‘Field delimiter’ = ‘ ‘, ‘Join delimiter’ = ‘ ‘, ‘Mode’ = ‘Keep’, ‘Fields’ = ‘4’. The ‘Replace word’ rename mode allows to replace one or more words (‘Targets’ parameter) by a ‘Replacement’ word. Moreover the ‘Regex’ parameter allows to specify whether target words should be evaluated as regular expressions or not (see section Regular expressions to know how to define regular expressions). As you can see, there are two description fields providing information about gene and protein. Thus, this rename mode is useful to remove those words and keep only the actual information values. The following example illustrates this process. The configuration applied to do this should be: ‘Targets’ = [‘[gen=’, ‘[protein=’, ‘]’ ], ‘Regex’ = ‘not selected‘, ‘Replacement’ = ‘’. The ‘Replace interval’ rename mode allows to replace an interval delimited by two words (‘From’ and ‘to’) by a ‘Replacement’ word. As you can see, there are two description fields providing information about gene and protein and some information delimited by ‘/’. Thus, this rename mode is useful to remove this interval. The following example illustrates this process. The configuration applied to do this should be: ‘From’ = ‘ / ’, ‘To’ = ‘‘ / ’, ‘Replacement’ = ‘[DELETED]’. Delimiter: the delimiter between the word to add and the header. Note that the word to add also includes the index. Add index: whether an index should be added to the defined word or not. Index delimiter: the delimiter between the word to add and the index number. As an example, consider that you are interested in adding the word ‘Sequence’ delimited by a ‘_’ with an index delimited by a ‘_’. The resulting word can be added as prefix, suffix or overriding the entire header. For the sake of simplicity, input sequences do not contain a description in their headers. Fragment length: the fragment length or number of columns in which sequences are divided. The ’Remove line breaks’ option specifies that sequences should not be fragmented. Line breaks: the type of line breaks, which can be ‘Windows‘ or ‘Unix‘. Case: the case of the sequences. ‘Original‘ means that original case in input sequences is kept and ‘Lower case’ and ‘Upper case’ allows converting sequences to lower or upper case bases respectively. The following example illustrates how line breaks are removed from the input FASTA sequences by using this operation with the ‘Remove line breaks’ option selected. The following example illustrates how the length the input FASTA sequences is set to 4. This operation allows to grow sequences by merging those sequences with the specified ‘Minimum overlapping’ bases. Use the first sequence as reference sequence. Compare the reference sequence to the rest of sequences. For each pair of sequences, check if there is an overlapping of bases of at least the minimum size specified. This overlapping is searched at the beginning of the reference sequence and at the ending of the sequence being compared. If an overlapping is found, merge the two sequences. The merged sequences are removed from the set of sequences and the new one is added. Return to step 1. If an overlapping is not found between the first reference sequence and the rest of sequences, then step 2 is repeated for the rest of sequences repeatedly. The process stops when all sequences have been compared without merging any of them. The following example shows how sequences with a minimum overlapping of 6 in the input FASTA are merged. 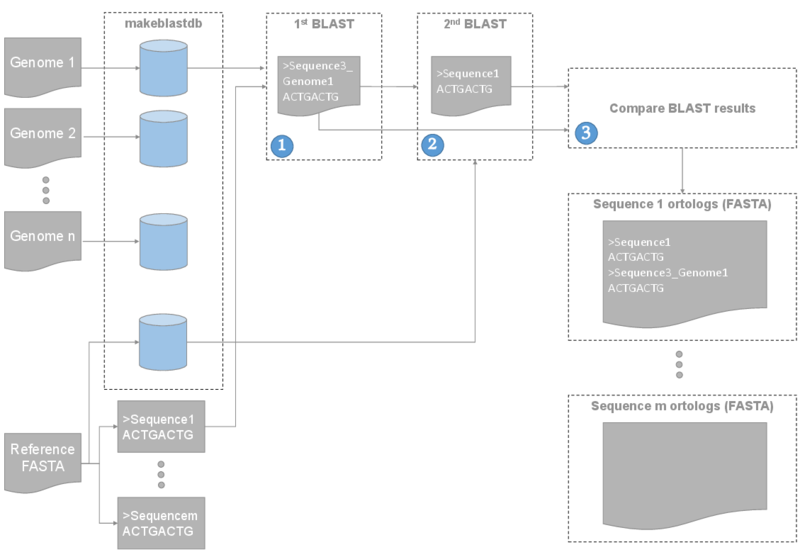 Sequence1 and Sequence2 have an overlapping region of 9 bases (CTCTCTCTC), thus they are merged in the output FASTA. The following example shows how sequences with a minimum overlapping of 4 in the input FASTA are merged. Sequence1 and Sequence3 have an overlapping region of 5 bases (AAAAA) in the highlighted area, thus they are merged in the first place. Then, the resulting sequence has an overlapping region of 8 bases with Sequence2, thus there is only one sequence in the output FASTA. Prefix: before the actual file name. In the example, with ‘Delimiter’ = ‘_’, the output FASTA would be named ‘Arabidopsis thaliana (thale cress)_GCF_000001735.3_TAIR10_cds_from_genomic.fna’. Suffix: after the actual file name. In the example, with ‘Delimiter’ = ‘_’, the output FASTA would be named ‘GCF_000001735.3_TAIR10_cds_from_genomic.fna_Arabidopsis thaliana (thale cress)’. Override: entirely replacing the actual file name. In the example, the output FASTA would be named ‘Arabidopsis thaliana (thale cress)’. Replace: replacing the accession number. In the example, the output FASTA would be named ‘Arabidopsis thaliana (thale cress)_TAIR10_cds_from_genomic.fna’. 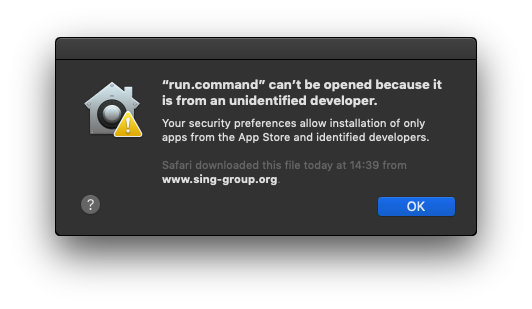 None: not modifying the file name. In addition to modifying the name of the FASTA files, this operation can also add this information to the sequence headers. 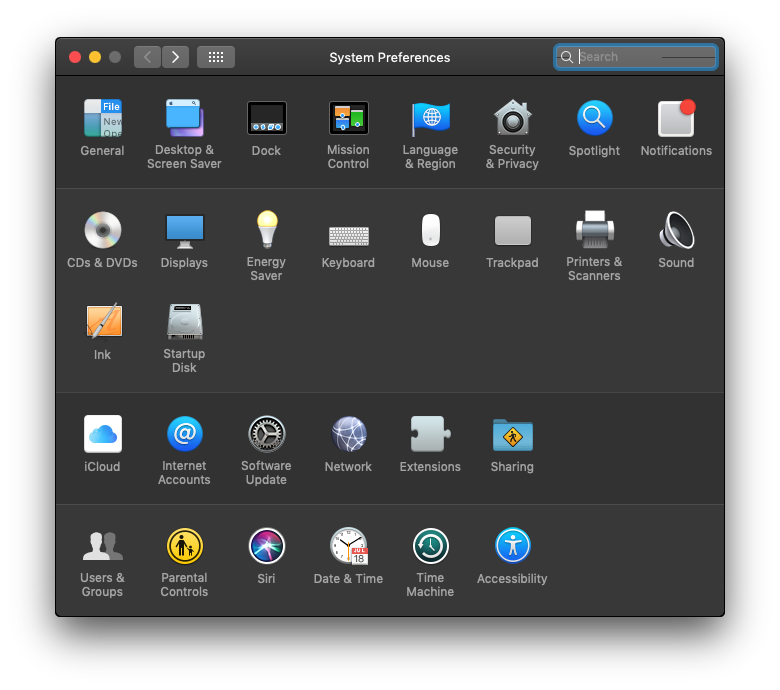 This is configured in the ‘Sequence headers’ area shown below. This option does the same than the ‘Add prefix/suffix‘ rename mode of the Rename header operation (see section Add prefix/suffix), being the organism name the string to add to the sequence headers. Replace blank spaces: whether blank spaces must be replaced or not. Replace special characters: whether special characters must be replaced or not. Special characters are ‘<‘, ‘>‘, ‘:‘, ‘‘, ‘/‘, ‘|‘, ‘?‘, and ‘*‘. Replacement: the replacement string for those special characters. Save replacements map: whether the replacements map must be saved or not. This is useful to know how accession numbers have been replaced. File: the file to save the replacements map. Finally, this operation also allows obtaining additional information from the NCBI Taxonomy. The ‘NCBI Taxonomy information’ panel allows choosing what fields should be added to the organism name when applying the operation. Fields are added with the ‘Delimiter’ as separator. For instance, the accession number ‘GCF_000001735.3’ has this information page: https://www.ncbi.nlm.nih.gov/Taxonomy/Browser/wwwtax.cgi?mode=Info&id=3702. If you select ‘Kingdom’, then the string associated to it would be ‘Arabidopsis thaliana (thale cress)_Viridiplantae’. Note that some accession numbers or organisms may not have available information for all fields. In that case, those fields are ignored. This operation allows to merge all the selected input FASTA files into a single output FASTA. The ‘Name’ parameter defines the name for the output file. Additionally, you can specify the FASTA format parameters in the ‘Reformat output file’ area (see section Reformat file to learn more about this formatting). The following example illustrates how input FASTA files 1 and 2 are merged into a single output FASTA file without line breaks. This operation allows to undo a sequence alignment by removing ‘-’ from sequences. Additionally, you can specify the FASTA format parameters in the ‘Reformat output files’ area (see section Reformat file to learn more about this formatting). The following example shows how ‘-’ are removed from the sequences in the input FASTA file. This operation allows to translate nucleic acid sequences to their corresponding peptide sequences. It can translate to the three forward and three reverse frames, and output multiple frame translations at once. Considering frames 1, 2 and 3: by selecting this option, three translations starting at frames 1, 2 and 3 are created. Use reverse complement sequences: whether reverse complement of sequences must be calculated before translation or not. If not selected, sequences are used as they are introduced and therefore the three forward frames are obtained. If selected, the three reverse frames are obtained. The following example shows how sequences are translated in the three frames without using the reverse complement sequences. Note that stop codons are marked with an *. The following example shows how sequences are translated in the three frames using the reverse complement sequences. This operation allows to disambiguate duplicated sequence names (identifiers). The configuration panel allows to choose the way of disambiguating them: Rename, to add a numeric prefix to disambiguate duplicate names, or Remove, to remove sequences with duplicate identifiers, keeping the first occurrence. The following example shows how sequences with duplicate names in the input FASTA are removed (in the Removed Output FASTA) or renamed to avoid those redundancies (in the Rename Output FASTA). Sequence type: the type of sequences in the selected files. For nucleotide sequences, ambiguous positions are indicated using the IUPAC ambiguity codes (http://www.dnabaser.com/articles/IUPAC%20ambiguity%20codes.html). 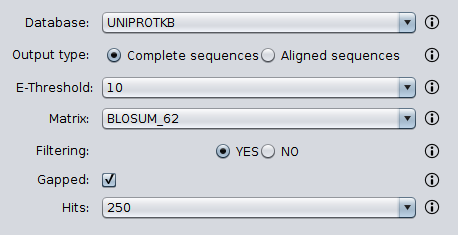 For protein sequences, ambiguous positions are indicated as the ’Verbose’ option explains. Minimum presence: the minimum presence for a given nucleotide or amino acid in order to be part of the consensus sequence. Those positions where the most frequent base is under this threshold are represented by an N (nucleotide sequences) or X (protein sequences) in the consensus sequence. Verbose: in protein sequences, when this option is unselected then X is used for ambiguous positions in the consensus sequence. On the other hand, when this option is selected, then all amino acids in such positions are reported (e.g. [HWY]). Reformat output file: allows to specify the format parameters of the output FASTA containing the consensus sequence (see section Reformat file to learn more about this formatting). The following example shows how nucleic acid sequences in the input FASTA are processed to create a consensus sequence using two different minimum presence thresholds: 0.2 and 0.6. The following example shows how protein sequences in the input FASTA are processed to create a consensus sequence using a threshold of 0.4 and both verbose and not verbose options. ‘Sequence name’ means that the sequences are “concatenated if they have the same sequence names (identifiers). 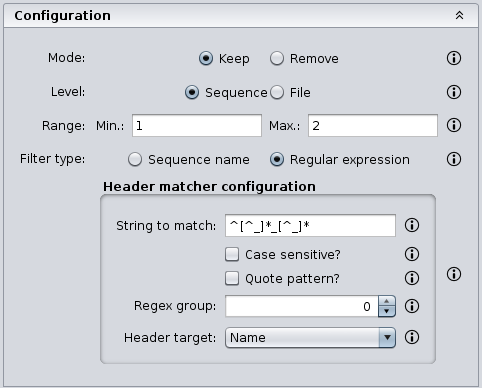 ‘Regular expression’ means sequences are concatenated by matching headers using the configuration specified in the Header matcher configuration panel. Additionally, you can specify the FASTA format parameters in the ‘Reformat output file’ area (see section Reformat file to learn more about this formatting). The following example illustrates how sequences with the same sequence names in the input FASTA files 1 and 2 are concatenated and written as single output FASTA. On the other hand the ‘Regular expression’ matching mode allows more complex concatenations. For instance, it can be used in those scenarios where sequences from two or more species are mixed in several FASTA files and one FASTA file containing the equivalente sequences is wanted. Consider the input FASTA files below that contains sequences from three species: Homo sapiens, Gallus gallus, and Mus musculus. When it is processed using the configuration below, one output FASTA file is obtained. Basically, the regular expression ^[^_]*_[^_]* is able to extract the common species names from the headers so that sequences are concatenated based in them. Start with the first sequence (FS) and compare it against the remaining ones. For each pair of sequences (FS vs SS), it is considered that they are isoforms if they share a word of the specified length (Minimum word length). If they are isoforms, the second secuence (SS) is marked as isoform of the first sequence (FS) so that SS will be not be taken for further comparisons. Repeat steps 1 to 3 for the remaining sequences. 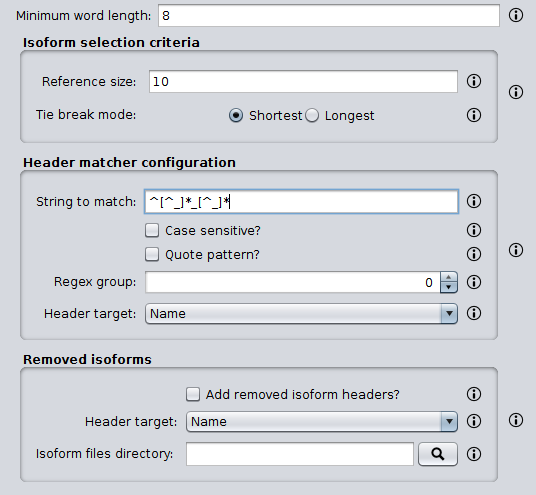 Now, for each group of isoforms, the Isoform selection criteria is applied to select which isoform should go to the output file. This algorithm is applied to all sequences in each input FASTA file. Nevertheless, by using the Header matcher configuration, it is possible to split them in groups that will be processed separately. This option is meant for those scenarios where sequences from two or more species are mixed in the same FASTA file and this operation should be applied to each species separately. Minimum word length: the minimum length of word to consider that two sequences are isoforms. Isoform files directory: whether the removed isoform names should be saved into a CSV file or not. This allows an easy identification of those sequences that had isoforms in the output files. If you do not want to save them, leave this file empty. Otherwise, choose the directory where such files should be created. 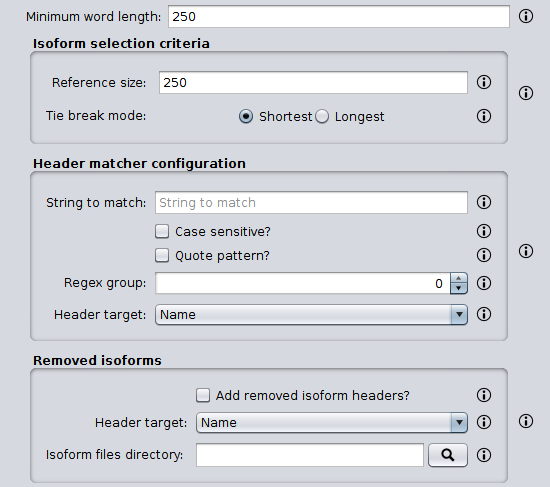 Isoform selection criteria: the configuration of the criteria to select which isoform should go to the output file. Reference size: the isoform with the length closest to this reference size will be selected. 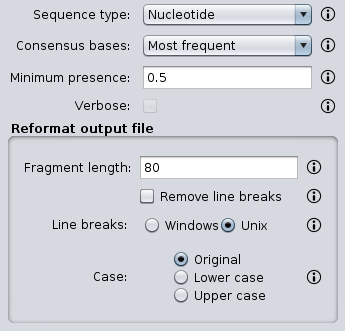 In case of having two isoforms that are at the same distance, the tie break mode option allows specifying which one should be selected. Tie break mode: shortest means that the sequence with less bases will be selected as isoform and longest means that the sequence with more bases will be selected as isoform. 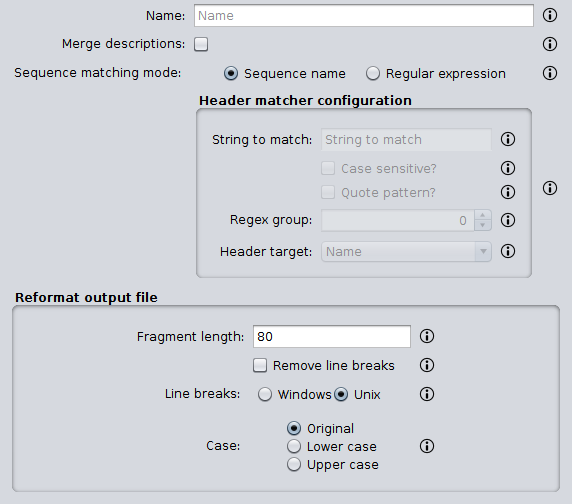 Header matcher configuration: this option allows to specify whether sequences must be grouped before the identification of the isoforms. Leave it empty if isoforms must be removed at a file level. In contrast, if you want to make groups of sequences before the identification of the isoforms, here it is possible to configure how sequence headers must be matched in order to group sequences. Check the manual for examples. The following example illustrates how isoforms in the input FASTA file are removed so that the output FASTA only contains those with a sequence length closest to a Reference size of 10. The Minimum word length is 8. As explained before, the Header matcher configuration allows to split the input sequences in groups that will be processed separately. 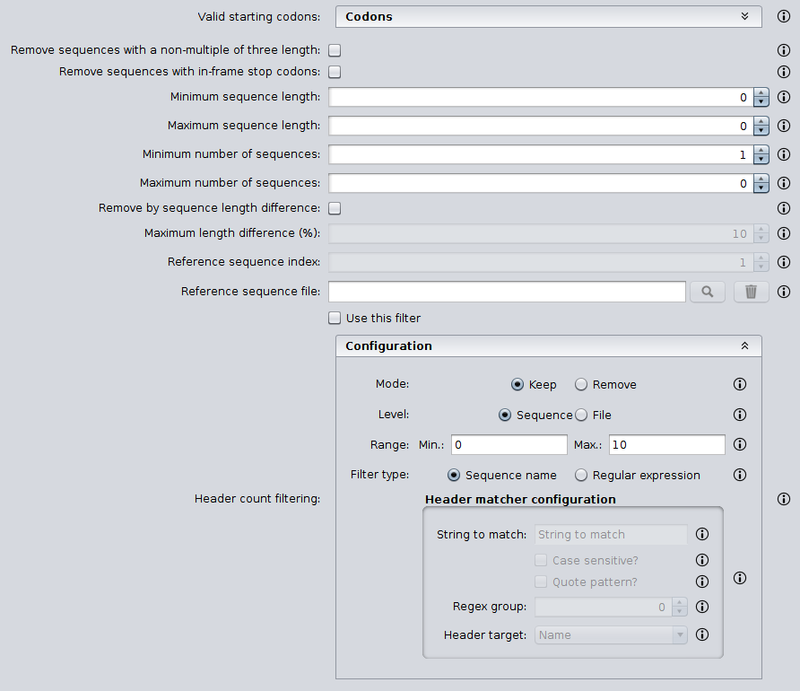 This option is meant for those scenarios where sequences from two or more species are mixed in the same FASTA file and this operation should be applied to each species separately. Consider the input FASTA below that contains sequences from both Homo sapiens and Mus musculus. When it is processed using the configuration below, the output FASTA is obtained. Note how the Mus_musculus_3 sequence is present in the output file although it is an isoform of the Homo_sapiens_1 sequence. This is because the regular expression ^[^_]*_[^_]* splits the sequences in two groups: those containing Homo_sapiens and those containing Mus_musculus, which are processed separately. This operation allows to make all the possible pairwise comparisons on the input files. 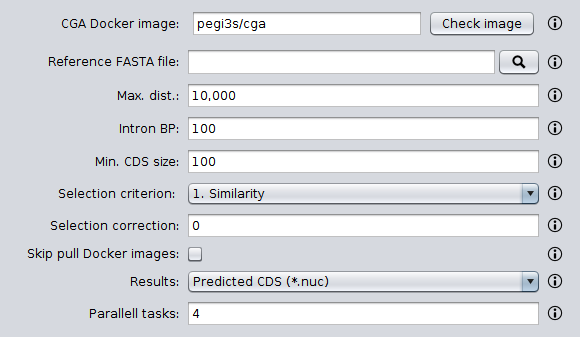 The configuration panel allows to choose the Sequence target, which is the part of the sequences that must be used to compare them, and also the Reformat output file settings, which allows to specify the format parameters of the output FASTA files containing the comparison results (see section Reformat file to learn more about this formatting). The following example shows how the two input FASTA files are compared using the sequence nucleotides as Sequence target. This operation allows to perform different BLAST queries using the selected FASTA files. Regarding the database to use in the queries, there are two possible modes: querying against all the selected FASTA files or querying against each FASTA file separately. Regarding the query, there are also two possibilities: using the sequences in one of the selected FASTA as queries or using the sequences in an external FASTA file as queries. When performing this operation, one blast query is executed for each sequence in the FASTA file. The figure below illustrates the process followed when a query against all selected FASTA files is performed. Firstly, one blast database is created for each selected FASTA file. Then, one alias referencing to all the databases created before is created. Finally, each sequence in the FASTA file used as query source is executed against the alias. As a result, this mode creates as many output files as sequences in the FASTA file. To create these output files, the sequences where hits were found are retrieved from the database. On the other hand, the figure below shows the process followed when queries against each selected FASTA file are executed separately. Firstly, one blast database is created for each selected FASTA file. Then, each sequence in the FASTA file used as query source is executed against each of the databases. As a result, this mode creates as many output files as sequences in the FASTA file multiplied by the number of selected FASTA files. To create these output files, the sequences where hits were found are retrieved from the corresponding database. First, the ‘Blast configuration’ area allows to select the execution mode of Blast: system binary indicates that blast will be executed directly using its binaries and Docker image means that a Docker image will be used instead. In the system binary mode, the path where the blast binaries (makeblastdb, blastdb_aliastool, blastdbcmd, blastp, blastn, blastx, tblastn, and tblastx) are located must be specified. 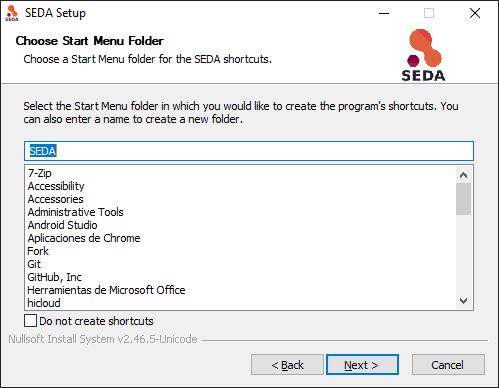 If you have them in the system path, just click the ‘Check blast’ button to make sure that SEDA can correctly execute them. In the Docker image mode, the default image is already set, although it is possible to choose a custom one provided that it have the blast binaries in the system path. Then, the ‘DB configuration’ area allows to control some aspects related with the databases created in the process. The type of the database is automatically selected according to the blast type to execute. This area allows to indicate whether the databases and alias must be stored in a directory of your choice. Otherwise, temporary directories are used and they are deleted at the end of the process. Nevertheless, may be interested in storing the databases for two reasons: use them again in SEDA or use them in BDBM (Blast DataBase Manager, http://www.sing-group.org/BDBM/). 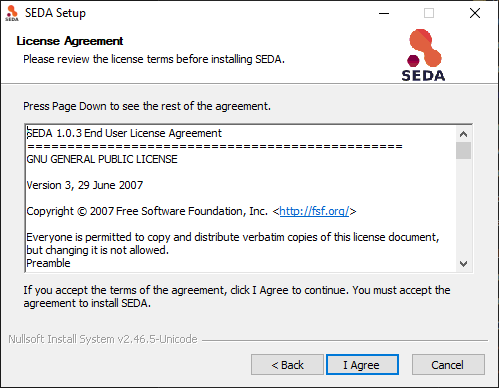 SEDA can reuse databases since if databases with the same name exist in the selected directory they are not created again. Finally, the ‘Query configuration’ area allows to control how queries are performed. As explained before, first you must choose the query mode in the ‘Query against’ parameter. Secondly, you must choose the blast type that you want to perform using the ‘Blast type’ parameter. 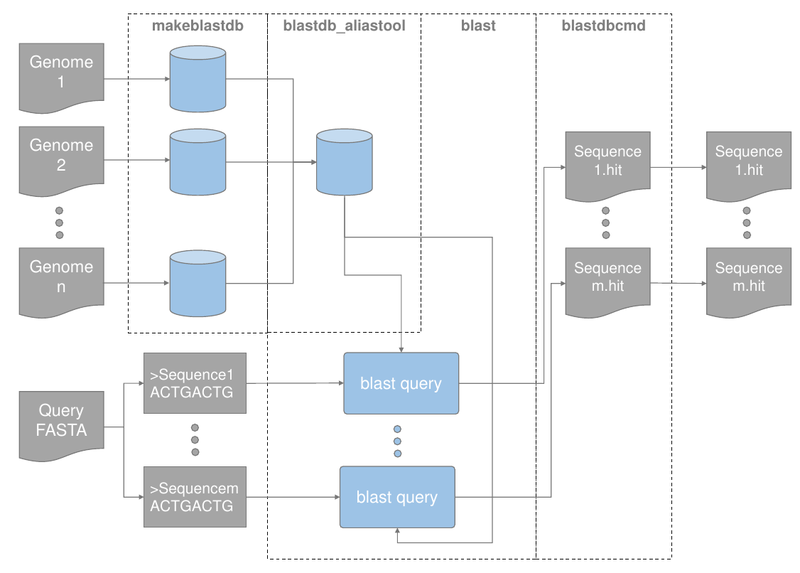 By selecting the blast type: (i) the type of database is automatically determined, and (ii) if blastx or tblastn types are selected, then you will only be allowed to select a genome query from an external file because the selected files used to construct the database cannot be used as query (blastx uses a database of proteins and a query of nucleotides and tblastn uses a database of nucleotides and a query of proteins). 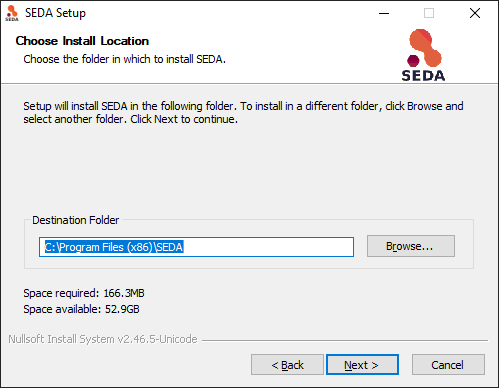 From selected file: this option allows to select one of the selected files in SEDA using the ‘Genome query’ combobox. From external file: this option allows to select an external FASTA file to be used as genome query file. Expectation value: the expectation value (E) threshold for saving hits. Max. target. seqs: the maximum number of aligned sequences to keep. Additional parameters: additional parameters for the blast command. And finally, the ‘Extract only hit regions’ parameter allows to define how output sequences are obtained. 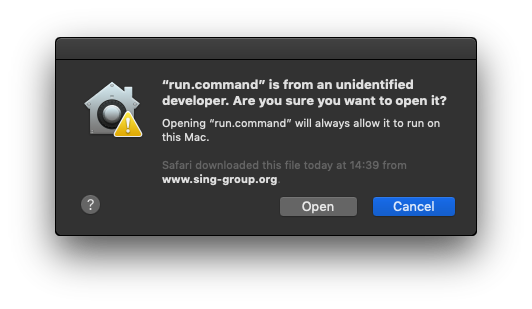 By default, this option is not selected, meaning that the whole subject sequences where hits were found are used to construct the output FASTA files. 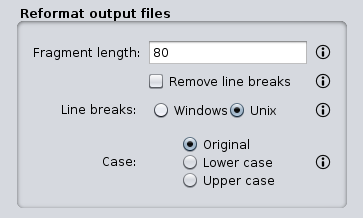 If this option is selected, then only the part of the subject sequences where the hits were produced are used to construct the output FASTA files. Within this option, the ‘Hit regions window’ parameter allows to specify the number of bases before and after the hit region that should be retrieved. A blast query against the first FASTA (hereafter, the reference FASTA) is performed using the reference sequence as query. Only the first hit is considered. 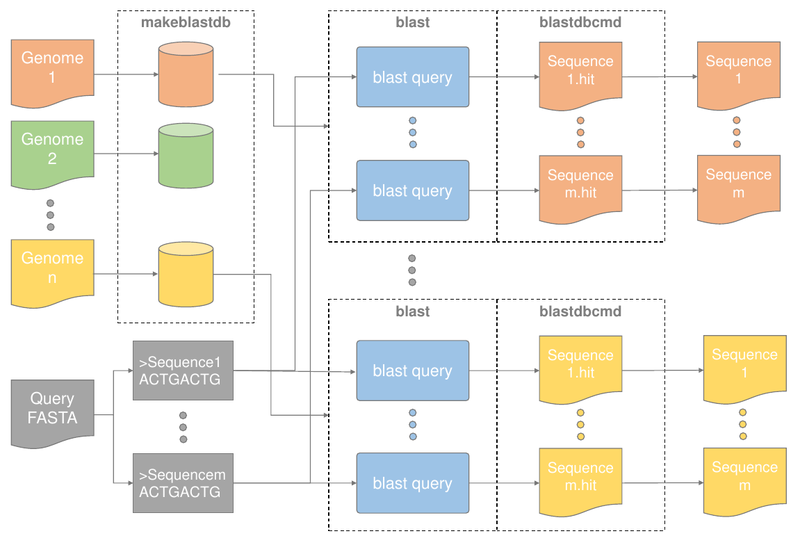 The sequence associated to the first hit in the target FASTA is used as query in a second blast query against the reference FASTA. Again, only the first is considered. If both sequences are the same, then the sequence found in step 2 is reported as ortholog. If both sequences are different, then the sequence found in step 2 is reported as ortholog if the Report non-exact orthologues is being used. Steps 1 to 3 are repeated for each target FASTA available. Then, the ‘DB configuration’ area allows to control some aspects related with the databases created in the process. The type of the database is automatically selected according to the blast type to execute. This area allows to indicate whether the databases must be stored in a directory of your choice. Otherwise, temporary directories are used and they are deleted at the end of the process. 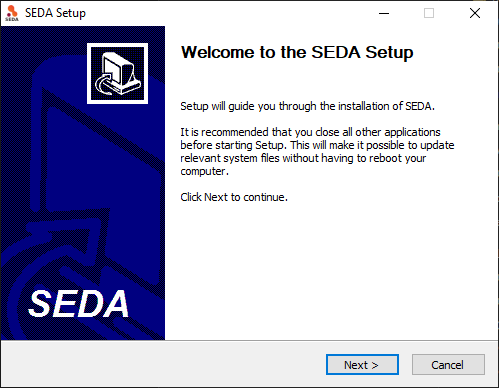 Nevertheless, you may be interested in storing the databases because SEDA can reuse them in the future: if databases with the same name exists in the selected directory they are not created again. Finally, the ‘Query configuration’ area allows to control how queries are performed. First, you can choose the ortholog report mode using the ‘Mode‘ parameter and choose ‘Report exact orthologues’ or ‘Report non-exact orthologues’. Secondly, you must choose the blast type that you want to perform using the ‘Blast type’ parameter. 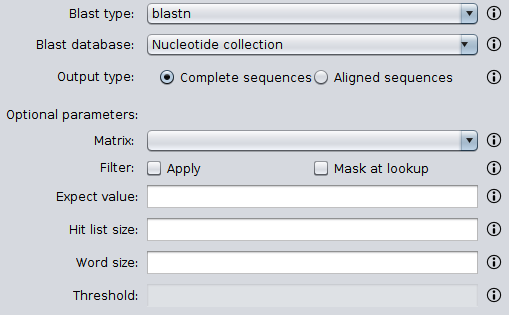 By selecting the blast type: (i) the type of database is automatically determined, and (ii) if blastx or tblastn types are selected, then you will only be allowed to select a genome query from an external file because the selected files used to construct the database cannot be used as query (blastx uses a database of proteins and a query of nucleotides and tblastn uses a database of nucleotides and a query of proteins). This operation allows to use Clustal Omega (http://www.clustal.org/omega/) to align the input FASTA files. First, the ‘Clustal Omega configuration’ area allows to select the execution mode of Clustal Omega: system binary indicates that Clustal Omega will be executed directly using its binary and Docker image means that a Docker image will be used instead. In the system binary mode, the path to the Clustal Omega binary file must be specified. If the Clustal Omega binary is in the path (clustalo in Unix systems and clustalo.exe in Windows systems), then this can be empty and the Check binary would say that it is right. In the Docker image mode, the default image is already set, although it is possible to choose a custom one provided that it have the Clustal Omega binary in the system path. Num. threads: the number of threads to use. Additional parameters: additional parameters for the Clustal Omega alignment. © Copyright 2017-2018, Jorge Vieira, Miguel Reboiro-Jato and Hugo López-Fernández.